This evening I am the guest on #MGiechat on Twitter, run by the wonderful E.R. Murray. To prepare I’ve been thinking about the questions she has set and I have posted some answers below in case they are useful to other writers. Q1: What’s your definition of a professional writer? Interesting question. A professional children’s writer is someone who makes their living from writing or activities linked to their writing. Most professional writers do not earn their living solely from advances and royalties. And royalties and advances go up and down, so it’s a good idea to have a second (or third!) income stream. I’m not sure relying on your creativity to earn you a crust is the best way to encourage and nurture it either. Elizabeth Gilbert is very good on this in her book Big Magic. She explains putting demands on your writing can scare it away. Personally I cherish my creative life more and more as I get older. I spend 2 to 3 days a week writing, and 3 to 4 days doing other work. Yes, that adds up to 7 days sometimes! Programme book festivals (ILFD, Dubray StoryFest – 29th Sept in Airfield, Dundrum – do go!). The common thread to all of this – CHILDREN’S BOOKS! Roughly 1/3 of my income comes from book advances and royalties, 1/3 from teaching, schools visits and other events (I’ll come back to this later as it’s important), 1/3 from programming and other work. Q2: People believe the holy grail is to be getting paid for just writing - but how realistic is that? How does a professional writer really make a living? See above! For about 8 years I wrote full time, my income came from advances and royalties. But the books I want to write and work on now are not series books and are not as commercial as my previous books. My latest two - Blazing a Trail which is out in October and A Sailor Went to Sea, Sea, Sea (with Lauren O’Neill and Steve McCarthy) - are books that are mainly for an Irish audience. I have adored working on them both with the team at O'Brien press. But it does mean I need to work on other projects to pay the bills. But that is my choice. And the next two are similar – passion projects. I’m lucky to have that choice. Most of my children’s writer friends are similar – they have some years where they are writing full time, other years when they are doing other work too. That is normal. In my case it suits me, it keeps me engaged and interested. I’m not sure I’d be able to go back to just writing. I’m having too much fun! Q3: How much should a writer charge for their time? And how do writers go about having this conversation? Writers should always charge for their time when it comes to events. If you have a new book out your publisher may ask you do to some promotional events, that is of course fine and I always support my publishers in this way. But schools, libraries, festivals – you must charge for your time. * It is standard practice that writers do promotional events to publicise a book and don’t receive a fee, though they are earning their usual royalty on sales generated by such events. This should occur in the weeks or months ahead of, and just after, publication of that book. When a school or library approaches you to do an event – quote these recommended fees. Then prepare your event meticulously. Make sure you give your all at the event. Arrive punctually and be professional at all times. I often give the school a copy of one of my books for the school library. I have also pasted a link below to a blog about approaching or pitching to festivals. The ones I programme are curator led, so I don’t generally take many proposals (1 out of 25 events might come from a proposal and it’s usually a workshop), but some other festivals do. Authors Aloud, an organisation that helps schools to find authors to visit them, said writers should only do “two or three” free events at the start of their career as a learning exercise and ask for feedback from the school in return. (Clara) Vulliamy said all authors should charge a similar rate because “one of the worst things you can do is offer yourself at a lower price. That muddies the water and makes it harder for the rest of us”. Q4: People need practice, but working for free undermines other writers. What advice do you have for writers starting out with events? If You Have No Experience – Go and Get Some. Prepare an event and deliver it on a trial basis in creches, schools, libraries, retirement homes. Anywhere that will have you. Make your mistakes early and learn from them. Ask for feedback. Ask an experienced writer if you can shadow them. Or go to events at festivals and see how other writers do it. Learn from them and then come up with your own event. Prepare a script for your event and practice it until it’s perfect. Most events are 60 mins. Break this down: 20/30 minutes talking is perfect. Add 1 or 2 x 5 min readings within or after the talk (never more) + 20 mins for questions at the end. Your event is not a hard sell for your book. In fact some of the best talks I’ve ever heard are not about the artist’s book at all. Eoin Colfer is one of the best in the business (watch him in action on You Tube) and he rarely mentions his books. Think about using props, music, dance, theatre, images (although powerpoint presentations can go wrong so always be prepared to deliver your event without it). Think about using costumes or at the very least looking visually appealing to children (see Sarah McIntyre and Philip Reeve’s costumes). Q5: You wanted to talk about the reality of book advances @sarahwebbishere – fire away! She explained that advances are paid to a writer based on how many books the publisher thinks they can sell and the price of the book. Little Island pay a standard advance to all writers, both new and established of e1k this was something I hadn’t realised and useful to know. Authors usually get 7.5% royalty of the recommended retail price of the book. The average Irish print run is 2.5k copies Grainne said. And finally an article from the Irish Times about Writers’ Pay in Ireland by Martin Doyle and Freya McClements which includes quotes from Donal Ryan and Liz Nugent. “Maybe now people will stop asking me why I’m driving a 13 year old car,” says Liz Nugent. Now go write! Write the book of your heart and enjoy the writing journey! Many book festivals start programming six months to a year in advance. Many key names would be in place 6 to 10 months in advance for the children’s programme: ie Francesca Simon, Judith Kerr (or sometimes more). If you are thinking about approaching a festival (and more on how to do this in a moment), make sure you don’t leave it too late. I would suggest at least 4 months before the festival is on. 1/ International names who will attract a large audience and fill a theatre (300+ seats) eg Francesca Simon, Eoin Colfer, Julia Donaldson, Michael Rosen. 3/ Writers who are excellent at performing for school audiences and who have a strong body of work behind them. Experience is key for school events in a theatre (or in any venue). Ex-actors are particularly good, people who can also draw are useful. Eg Guy Bass, Steve Cole, Niamh Sharkey, Marita Conlon McKenna, Oisin McGann, Judi Curtin, Alan Nolan, Nicola Pierce. 4/ Exceptional storytellers eg Dave Rudden and Grainne Clear. 5/ Exceptional workshop leaders eg Dave Lordan, Celine Kiernan, Niamh Sharkey, Claire Hennessy, Sarah Crossan. The best ones engage 100% with the young writers/illustrators and bring something unique to their workshops. 6/ Exceptional new/newish writers for panel events featuring new voices – eg Catherine Doyle (for her MG book, coming in July) would be on my wish list for autumn 2018, Bethan Woollvin, John Kane – new picturebook makers. I am lucky to be sent early proofs which I read eagerly. If you have written a brilliant, original and exciting book you have a good chance of being invited to a book festival. FOR ME IT ALL STARTS WITH THE BOOK. 7/ Exceptional picture book makers to give talks/workshops to children and also masterclasses to adults eg Yasmeen Ismail, Oliver Jeffers, Chris Judge, Chris Haughton, Niamh Sharkey. 8/ Unusual and original book related events. Esp non-fiction events in fact – history, natural history, science, maths. Come up with a unique and inspiring event and practice, practice, practice. 9/ Artists who are willing to work hard and go the extra mile. Artists who will muck in. Artists who offer to fill in for other artists when there’s a last minute illness or delay. Artists who are fun to work with and above all, professional. I’ll never forget Sarah McIntyre and Philip Reeve mucking in at one of the festivals I programmed when one of speaker’s children was rushed to hospital. They did his events for him. 10/ Strong local talent – writers, poets, storytellers, illustrators, picture book makers and more. Experienced and debut writers alike. 1/ People with no experience. Get out there. Start with your local school or library and build up your experience. See below for some ideas. 2/ Writers of books I have not read or heard of (if you’re a new writer, ask your publisher to send me your book). If you’ve written an amazing book, you have a great chance of being invited to a festival on that basis alone. 3/ People who think a book event means standing and reading your book for 40 mins and then taking some questions. Unless you are Judy Blume or Jacqueline Wilson, this will not work. Not that Judy or Jackie would ever dream of doing this! I’m a Self-Published Writer, Can I Apply to Appear at a Festival? Most festivals are curated festivals. This means the curators select the artists. Yes, you can apply to appear, if you think you can offer something original and exceptional (and your book is professionally produced and an excellent read – children deserve the best literature we can give them). But please note that very few artists who apply directly are selected; most artists are invited. This goes for all writers, not just self-published writers. 1/ Non-fiction events – science, natural history, history. If your book is fiction, you can still offer a festival a non-fiction event. I have put together an event called ‘Talk Like a Dolphin, Sing Like a Whale’ for festivals/schools – based on whale and dolphin communication. 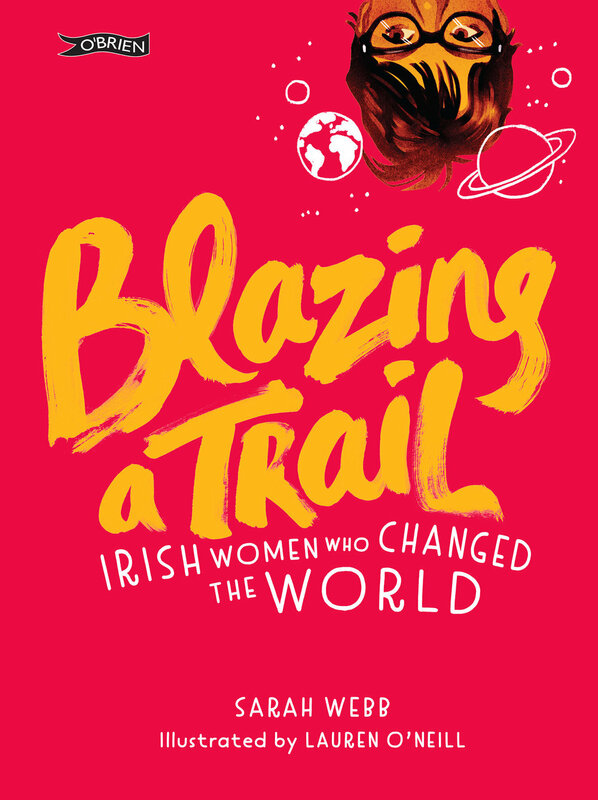 I have some Blazing a Trail events coming in the autumn based around remarkable Irish women. I’d love to see some interesting suffragette events offered to me, workshops around diversity or equality. Think outside the box. 2/ Innovative workshops – offer me something different and put time and passion into developing your idea. Again, you need experience. Offer to present your workshop at a local school. Ask the students and teachers for feedback. For eg I have created a Book of Kells workshop for Hay Festival in Kells, with real vellum and swan quills; a Jane Austen workshop for mothers and daughters and I do a rhyme, song and craft event around A Sailor Went to Sea, Sea, Sea. Be inventive! The more prep work you put in, the better a workshop or event will be. 3/ Innovative pairings – dancers, musicians, artists, puppeteers, other writers. For eg in 2016 I teamed up with Judi Curtin and we talked about our friendship at lots of the major festivals. It was our ‘Friendship Tour’. Previously we have toured with Oisin McGann (The Ideas Shop) and Sophia Bennett (Your Wildest Dreams Tour). Team up with someone interesting and put together a cracking event. It’s also a lot of fun! 4/ Events for children with special needs. In previous years I put together a How to Catch a Star workshop with Deirdre Sullivan for children on the autistic spectrum. 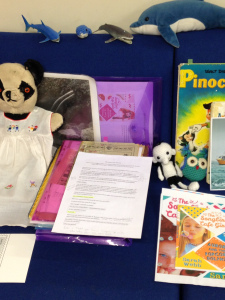 5/ Early years events and workshops – age 0 to 5. There is a growing demand for quality, creative events for very young children and their associated grown up/s. Before you do – research the festival and make sure it actually programmes the kind of event you are thinking of offering. Start local. 1/ It’s best to apply thorough your publisher. Tell your publisher you are interested in appearing at (X) festival and ask them for their opinion. They will either a/ say yes, great idea or b/ suggest you might need a little more experience. If their answer is b – go off and get that experience and go back to them. 2/ Be a festival supporter - it’s important to attend and support festivals if you’d like to appear at them. You also learn a lot by watching and listening to other artists doing events. Take a notebook along and jot down things that work and things that don’t work. 3/ Make a demo video of yourself in action and upload it to You Tube. Nothing fancy – you can take it on your phone. Let programmers see you in action. 4/ If you don’t have a publisher, you can apply yourself. Email the children’s curator/programmer - outlining your book, the events you’ve done and what you can offer them: workshops, events etc. It is vital to have a professional photo to send festivals for their brochure. It must be high res, clear and should show something of your personality. No frowns, please. Ask someone to come along to one of your events and take an in-action photo if possible. The blurb for your event and your biog should be short, well written and relevant. I rarely get sent interesting titles for events – be the one who sends me something unusual and clever! If the programmer says no, do not hound them under any circumstances. That is not going to make them change their mind. Prepare an event and deliver it (yes, free) in creches, schools, libraries, retirement homes. Anywhere that will have you. Make your mistakes early and learn from them. Drama workshops for children; screen writing workshops for children; animation workshops for children – also the same for teens. We would love any writers to contact us either through their publisher or directly themselves, but we would like a brief biog about themselves and their writing included. The events that we are looking for are fun, interactive events, and creative writing workshops. How to approach a festival: For me I don’t mind if it’s via agent/publisher or on your own bat as long as the contact is respectful, informative and useful to my purposes eg: I want to know what age you do events for, what type of events you prefer and how much you want to charge. I feel it’s essential to research the festival to see if you suit it, otherwise you are banging on a closed door and it’s important to remember that the programmer has a vision and if you don’t fit it, that’s unfortunately just how it is on this occasion. Events we’re looking for: Something more than the standard reading and signing, as this doesn’t generally work for younger audiences. In demand at the moment are events for 0-2 and 5-8. Join writer, Sarah Webb and illustrator, Steve McCarthy for this interactive event for the whole family. Revisit favourite childhood rhymes and songs such as She’ll Be Coming ‘round the Mountain (an American song with a very interesting Irish link), A Sailor Went to Sea, Sea, Sea and The Owl and the Pussycat, and discover new ones from Ireland and beyond. Join in the skipping (jump rope). Watch Steve draw owls, pussycats, boats and sailors, and draw along; and create your own colourful sailing ship. Sea-filled fun for everyone! This workshop is designed to give children a playful and engaging creative experience. Songs, rhymes and poems are part of every child’s literary heritage and we will share them with the audience in a novel, interactive way. Most importantly we aim to make the event dynamic, playful and inspiring for the audience. Sarah and Steve will welcome the children and associated adults as they arrive and give each of them a personalised name sticker. When all the participants have arrived Sarah will share some favourite rhymes and songs from A Sailor Went to Sea, Sea, Sea with the audience and Steve will draw along. Steve will then show the audience how to a sea creature and the audience will draw along. Sarah will then turn a skipping rope and encourage the children and adults to join in some Irish skipping games – including Cross the Crocodile River and Teddy Bear, Teddy Bear. Finally they will help the children create their own sailing ship using collage materials – felt, coloured card, scraps of material, metallic paper, lollypop sticks and straws. I love getting letters from readers in the post. Real letters are far more fun than emails. I love opening the envelopes, unfolding the letter inside, holding the exact piece of paper that a little while ago the sender was writing on. There's something quite magical about letters. 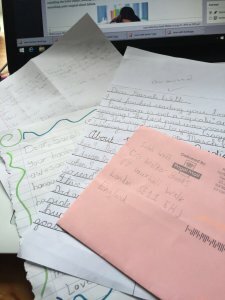 This week I answered three letters from young readers. Two of them were from Ireland, one was from the UK. Each contained questions for me. I thought I'd answer some of these questions below. Maybe they are questions that you would also ask me if you could. If you'd like to write to me, I'd be delighted. The address is: Sarah Webb c/o Walker Books, 87 Vauxhall Walk, London SE11 5HJ, England. I promise to write back to you. Sarah, how did you get the idea for Amy Green? My teen diaries. As a teen I wrote in them every day and it was fascinating reading back and seeing what made me happy, upset or angry at 14, 16 or 18. Judy Blume, Enid Blyton and all the wonderful writers I read as a child. I was and still am a huge, devoted reader. I found friends on the pages of books. Reading inspired me to write. What is Ireland like (this was from a UK reader) and where do you live? 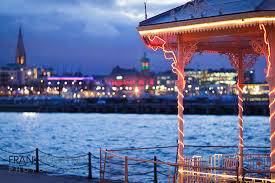 I live in Dun Laoghaire - below - a town 7 miles from Dublin city which has a large harbour. It has a great cinema, a theatre and the best library in Ireland, the Lexicon. We live on a long street which winds its way up a hill from the sea. In Ireland you are never far from the countryside and if you drive for a little while you'll hit green fields, hills and mountains. I also spend a lot of time in West Cork - above - which has the most stunning landscape. The people are very special too, warm, friendly and funny. It's hard to say what Ireland is like. It is a place where books and stories and cherished, which I think makes it very special. What I do know is that for me it's home and although I love to travel, my heart belongs to Ireland. Writer. It just goes to show that sometimes dreams really do come true if you work hard enough and follow your heart. What is being a writer like? Do you write all day? I'll answer these two questions together. I have lots of different kinds of days - writing days, school visit days, festival planning days, reading and reviewing days, teaching days. Most writers don't just write, especially children's writers - they do lots of other things too. Every week I spend 2 or 3 mornings writing - from 10am to 2pm - and 2 days visiting schools, teaching creative writing, reviewing and doing other bits of work relating to books. I try to write 2k words every time I sit down at my desk, that's my aim. I often don't hit this target, but sometimes I do. At the moment I am Writer in Residence in Dún Laoghaire so from September I will be hosting book clubs for young readers and writing workshops, that will be fun. What job would you do if you weren't a writer? A children's bookseller. One day I hope to own my own children's bookshop. Watch this space! This post first appeared on the Girls Heart Books website. One of my favourite parts of being a writer is talking to young readers about my work. Every week I visit 1 or 2 schools or libraries to talk to students. Here's the diary of one of those trips. 7am Get up and walk dog - I always pack my bag the night before my event. I have all kinds of things in my green event bag - books, photos, toy whales. 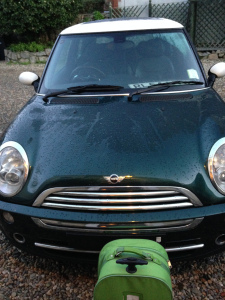 8am Say goodbye to my dog, Lucky and get on the road in my Mini Cooper. Yes, I have the same car as Clover in the Ask Amy Green books! 10.00am Arrive in Loughboy Library in Kilkenny and set up for my first event with the children from St John of God's National School. Can you spot the whale and dolphin models? There's a shark in there too - his tail goes from side to side, as he's a fish. Sea mammals' tails go up and down. 10am to 11.30am Talk to the students about growing up (I was late to reading and I talk about this and how having heart and grit are more important than being top of the class), my favourite books, how I became a writer and sea mammals. They ask me some great questions about writing, publishing and whales and dolphins. We do a sea mammal quiz - teachers against the pupils - and the pupils win! My latest book (out in March) called Aurora and the Popcorn Dolphin is all about a dolphin and I have a huge love for sea mammals, especially bottlenosed dolphins and humpback whales. I spent 2 years researching it and I'm still reading up about these amazing creatures. I don't think I'll ever know enough about them and new discoveries are made all the time. 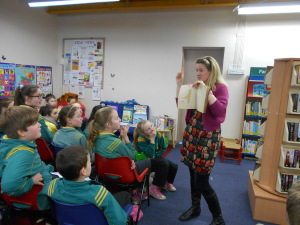 12.00 to 1.15 Here I am talking to the second school, Gael Scoil Osraí about my school days. I'm holding a copy book from when I was 5! Their teachers were pretty smart and when it came to the quiz they drew with the pupils (who are also very smart). This gang were particularly talented at singing humpback whale - it was a beautiful symphony of strange wailing and snorting noises! 1.30pm Hop in the car again after grabbing a sandwich and drive home again. 3.30 Arrive home and say hello to Lucky and the kids. Writers, do YOU enjoy school visits? Readers, has a writer visited YOUR school? I'd love to know all about it. This blog first appeared on Girls Heart Books website. They say you should never judge a book by its cover. But what about its title? Do you like this book’s title: Mollie Cinnamon is Not a Cupcake? Can you say why/ why not? Have a look around the nearest bookshelves. What do you think of the titles? With a friend, think of amusing and/ or unusual titles for some of the real books or make some up eg How Cheese and Crackers Brought About My Downfall, or The Many Vicissitudes of Apollyon O’Shaughnessy. You might choose your favourite and design a book jacket that would reflect your title. Click is the name of the dolphin living in Dolphin Bay and Mollie is excited to see him as she has never seen a real-life dolphin before. Many people love to swim with dolphins – but dolphins are wild animals and there are safety implications that must be evaluated and assessed before we jump into the water with a dolphin. Discuss the risks/ possible dangers and the best way of dealing with a situation where your friend might want to get in and swim (with or without a dolphin) in an unsupervised area. What could you say or do to persuade your friend to make a good decision? What might you do if your friend made a decision that might lead them in to danger? In the book, Granny Ellen is very superstitious, always saluting single magpies to ward off bad luck. She avoids walking under ladders and stepping on cracks in the pavement and picks up pins and “lucky pennies” all the time. She also makes wishes on all kinds of things: shooting stars, rainbows, engagement rings. Many people make a wish as they stir a Christmas pudding, or when they eat the first new potato of the year though it is best not to expect too much from wishes as you might well be disappointed! Some religions frown on making wishes /practising superstitions – can you think why? Make a list of other occasions that might cause Granny Ellen to make a wish/ and/or make a list of other superstitions commonly practised by people today. Your wish: Take a day to think about something you really wish for. You might write it in your secret diary, or on a slip of paper that you could roll or fold and hide in a safe place. Or you might type and then print your wish in class, and when everyone has done this, you could create a collage of wishes, or hang them on a branch of a tree and create a wishing tree. Sunny is a very talented artist and draws little cartoons to explain herself when she doesn’t feel able to speak. Her anxiety and extreme shyness has probably helped to bring about her selective mutism. Can you do some research on this disorder and write a few lines of Sunny’s diary, explaining how she felt on first meeting Mollie in chapter 4. Or you could take a leaf out of Sunny’s book and describe the meeting in a cartoon strip. Have you ever been away from your family for a long period? Can you imagine what it would feel like to leave your home even for a month? Draw a large heart on an A4 page. Draw a line down the middle to split the heart in two. On one side, write a list of all the things you’d miss about your home if you had to leave. On the other, write a list of the ten things you’d most like to take with you. As you work, think about the choices that migrant or refugee children have to make when they are forced to leave their homes, perhaps for ever. Little Bird is a small island off the coast of Ireland and Mollie thinks there it’s boring, boring, boring, with nothing to do and nothing to see, except maybe some tractor-spotting. As you read, make a note of all the attractions on the island, and design a brochure to encourage tourists to visit. And/or choose some part of the Wild Atlantic Way and design a brochure that Fáilte Ireland might use to attract more visitors to our western coast. The school uniform Nan finds for Mollie (chapter 6) is scratchy and beetroot-coloured and Mollie isn’t used to wearing a full uniform. What is your opinion of school uniforms? You might do a survey on the opinion of your class/ school and/or have a class debate to tease out the advantages and disadvantages of being dressed exactly like all your fellow pupils. You could address your findings to the Students’ Union/Council and/or the Board of Management of your school. Red Moll is a fictional character, but is inspired by Gráinne Ní Mháille or Granuaile, the warrior chieftain who ruled the seas and large areas of land around Co Mayo in the sixteenth century. With a large army and a fleet of ships, this unconventional woman lived by trading and raiding, and her captains demanded payment for safe passage from all who sailed her waters around Clew Bay off the west coast of Ireland. In your group, read more about the ‘Pirate Queen’ and write five of the facts you find most interesting about her life and times. Share these with the class. Nan and Mollie watch old films together. What movies would you watch with your grandparents/elderly relative? Draw a large tub/container with popped corn coming out the top. In the ‘tub’, describe your perfect afternoon at the movies, and in the ‘corn’ name the films you’d most love to watch with some older people. What has Mollie learned about making (and losing) friends in this book? Do you have any qualities that you feel are Friend-Makers or Friend-Breakers? Think carefully about the qualities you feel are non-negotiable/ absolutely necessary in a friend, and also about those things that are ‘friend-breakers’ eg bullying behaviour, disloyalty. Wanted: a friend for me. You have just placed an ad in a local paper to find yourself a friend. What qualities would you want this friend to have? What type of person would suit you best? Write a brief description, stating types of things you like to do with your friends. Before you start, try to think how classmates see you, why your friends like you – make a list of words you think describe you and what your friends think of you. If you were sponsoring the Songbird Café, what dish or cake would you like Alanna to dedicate to you? Help her out, design your own cupcake: What does it look like? What do you call it? Can you draw it and maybe post it to the school site /noticeboard? If each person in your class designed their own cupcake you could make a very colourful display for the entrance hall. For more detailed teachers' notes, with activities for every chapter see here. 1/ He's from Yorkshire but he has an odd accent (or so he says). 2/ He wrote the theme tune for children's art show, SmArt and children's show, Brum. 3/ Most of his books start life written on the edge of a soggy newspaper. 4/ His favourite author is Philip Reeve. 5/ He can play cat and dog noises on a synthesiser. ‘What’s that?’ Charlie says.We’re taking the short cut home from school, through the wood. It’s dark in here and the mouldy, damp leaves smell like rotten meat. ‘What’s what?’ I ask, stepping over a muddy patch and trying not to get my new white runners even filthier. Mum’s going to have enough of a fit already. It’s not my fault - you can’t play footie with the boys without getting your shoes a bit scuffed. He lowers his voice. ‘The rustling. I think there’s someone following us.’ A stick breaks and something moves in the bushes behind us. He’s right. There’s someone, or something there. I take a deep breath and swing around. And then I get the shock of my life . . . I wrote these opening lines for a Bord Gais Writing Competition for children of age 7+. I said yes to doing it because I knew it was something I could do quickly. I don’t know about you, but life’s moving pretty fast these days and I’m struggling a bit to keep up with all my various commitments. But I do everything I can to supporting anything to do with young readers or writers. The young writers entering this particular competition will be both boys and girls, so I made the two main characters one of each. I gave it a forest setting to make it a little unsettling/different, and ended it abruptly to get them instantly involved in the story, instantly thinking ‘who’s in the bushes? A monster, an alien, a girl from school . . .’. The young writers can add to the story and make of it what they will – a ghost story, a horror blood fest, a sci fi alien invasion, a unicorn fantasy tale – whatever genre or mash-up of genres they like. It took me roughly five minutes to think up and write, and a future ten minutes to edit and play around with it until I was happy. But here’s the thing – it took me fifteen minutes in total because my mind is trained to think of stories, characters and ‘what ifs’. My writing muscles are reasonably fit and healthy at the moment (wish I could say the same about the rest of me!). As a writer you have a huge advantage if you are writing fit. When I visit schools I always tell the children – ‘If you want to win the X Factor, you have to practice. If you want to run or hurdle in the Olympics, you have to practice; if you want to be a published writer, you have to . . . practice.’ And it’s true. It amazes me how many people think they can just pick up a pen, scribble down a first draft, and boom, they will be the next Marian Keyes or Jon Banville. I don’t think the average person has any idea how the writing process really works. The hundreds of hours that go into thinking, making notes, writing, rewriting (x 8/10/12 times in the case of most of my books), editing, copy editing. Julia is bang on. Regular writers get very twitchy if they haven’t been at the page enough. The page is their lodestar. I’ve been a published writer for over fifteen years now, full time for eight. And it has taken me a long time to find a writing routine that suits me, a balance between sitting long hours at my desk, and doing other things that I enjoy – like organising festivals, doing school visits and talks, touring – all which send me back to my desk happy and glad to be writing again. I’m a very sociable person, I like company, and I’m prone to feeling down and alone, so I have to be careful to pepper my writing week with solid, fun human interaction. But I miss my desk if I’m away from it for too long – it’s all about balance. Each writer has to find their own writing routine. But routine is the key. No practice without routine. No publication without practice and damn hard work, and as Patrick Ness always says ‘writing with joy’ - turning up to the page every day (or as often as you can), and writing as if it’s your last day on earth. And that’s the ‘secret’ of getting published in a nutshell – routine, practice, hard work, joy . . . So it’s back to the page for me to unleash some of that joy. Recently I spoke to thirty six-year-olds about my new Panda book, Emma the Penguin at the Dublin Book Festival. It was my first foray into the world of the jitter bugs that are 1st classers, and as I watched fellow Panda-person, Gillian Perdue round up her herd of cowboys and teach them how to line dance, I realised just how much I still have to learn about entertaining younger children. But I’d like to share what I have learned with you, in the hope it will prove useful to other writers, especially to those starting out. Firstly the bad news, it is no longer enough to write an amazing book. There are over 8,000 children’s books published annually, many of which are also amazing. Some of these amazing books will have a lot of money behind them, some of them will be ‘written’ by pop stars or models. Some of them will be written by authors with a long standing track record. But do not despair. There is a lot you can do to build your profile or ‘platform’ (as the market-eers like to call it) as a children’s writer before your book is published or even accepted for publication. Yes, modern children now have You Tube, Facebook, mobiles – but they are just different ways of communicating, but emotions don’t change. After all, your parents may not have had televisions or telephones growing up! If you want to write for children or teens, talk to children or teens, ask them what music they like, what actors, what books, what telly shows. The average 6th class girl’s favourite show is Desperate Housewives – who would have guessed? Take constructive criticism on your work from people who read a lot of children’s books. Teens make good critics, but younger children generally want to please. You might find an experienced librarian or teacher who will read your work – take on board what they say. Write from the heart and don’t be afraid of strong emotion. In Jacqueline Wilson’s books siblings jump out of high towers, killing themselves (My Sister Jodie), mums have nervous breakdowns and take emulsion paint baths (The Illustrated Mum). Oliver Jeffers’s latest picture book, The Heart and the Bottle, features a girl whose father has just died. She does not know how to cope with the grief so she takes her heart out and places it in a bottle for safe keeping. Strong stuff! If you want to write commercial children’s fiction, you must have an eye to the market. Read children’s books – especially in the age group/area you are interested in writing for – library/bookshop recommendations, modern classics, bestsellers and award winners. There are many good guides out there to help you pick fantastic books to read, my favourites being the Ultimate Book Guide series published by A & C Black, a must for anyone serious about writing for children or teens. This reading will also help you be aware of what modern children like and are interested in – and what works in a book. And also it’s fun; some of the best books out there are children’s books. It will also help you work out what age group you are writing for: early reader, confident reader, teen reader. This is vital. Children’s books are categorised in most shops and libraries by age. Young readers are aspirational – they like to read about children older than they are. If your character is 11, your readers will probably be 7/8 to 11. Are there any gaps in the market? In a word, yes. At a recent Irish Pen event called ‘New Kids on the Block’ event, Svetlana Pironko, Director of the Author Rights Agency, Siobhan Parkinson, Children’s Editor at Little Island (New Island’s imprint for children and teens), and Paddy O’Doherty, Children’s Editor at Puffin Ireland, explained what they were looking for. Paddy would like to see fiction for the 7 to 9 age group, but especially 8 to 12 fiction. She says ‘read Puffin books’ and see where the gaps in the list are – and try to fill the gaps! She is very interested in good animal and child stories like Charlotte’s Webb, humour for girls – Louise Rennison type books (she kindly mentioned my own Amy Green books as the type of thing she is looking for), and Fantasy. She said the books must be ‘well written, original ideas and voice, with a real sense of control’. She wants to feel that the author knows what she (or he) is doing, they have a sense of authority. 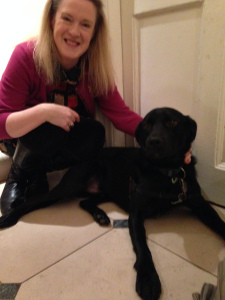 And overall she is very keen on reading more manuscripts from new authors – all good news! Siobhan Parkinson is looking for novels for age 9+ and teens. She is personally not a huge fan of fantasy, she prefers realistic novels and she, like Paddy is looking for ‘originality, a strong voice, someone who is in control of their writing’. Svetlana, however is a big fantasy fan and finds this sells best to international publishers. She also likes teenage/crossover fiction and says universal stories are vital; she is interested in books that can travel. In the UK, the publishers are veering towards ‘brand’ authors, authors they can work with over a number of books. And this goes for the picture books as well as novels. Oliver Jeffers for example has just signed a four book deal with Harper Collins for his new picture book series, The Hueys. Cathy Cassidy’s new book, Cherry Crush, will be the first book in a new series for girls. Once you have written your book, what next? While awaiting publication (or your manuscript to find a home), there are many things you can do to start building your profile. Of course, you must start working on your next book, that goes without saying. But you can also begin creating an on-line presence. A website, a blog or both. A Facebook, My Space or Bebo page. Down the line, your readers should be able to find out more about you online and contact you – it’s part of the job of a modern children’s writer. Blog about what interests you – whether it be books, writing, music, fashion, the universe – as long as it’s interesting! Decide your blogging market – are you targeting parents, teachers, librarians, or children themselves? For blogging inspiration, check out David Maybury’s blog, the children’s literature blog of record. Reviewing children’s books for Inis magazine is a good way of keeping in touch with current books and also getting your name out there. And it goes without saying, do join CBI and attend some of the wonderful events and workshops. Attend author events and hear other children’s authors speak about their work. Immerse yourself in the children’s book world and you will have a better chance of spreading the word about your book to the right people when it is published. Start reading your work to children right now. Think about what you have to offer as a performer. If you want to write for children, these days you have to connect with them LIVE. Find your own special way of doing events – standing in front of children and reading is not enough. The first and only commandment of doing events is: Thou Shalt Not Bore. I use a lot of show and tell during my talks. I show the audience photos, toys, books and clothes from my childhood and talk about what I was like as a child and teen. Then I use these stories to explain how I became a writer. Finally, be optimistic and have a strong constitution. You will probably be rejected many, many times before you make it. Even after fifteen years and twenty-seven books some of my ideas are still turned down. Write because you can’t not write. Multi-award winning writer Patrick Ness says write with joy. I would go further, I would say write as if it’s your last day on this earth. Give 100% every time you sit down at your desk. And hopefully your joy, passion and dogged hope will translate onto the page. Good luck and keep the writing faith!